Okt 2018, Japanese Super Taikyu Organisation wil use the all new RPD-5 LED Position Display system with Driver ID on all classes, after succesfull tests at Autopolis and Motegi, Super Taikyu will use multi color displays on all cars and the full color graphical LED display on the ST-X class (GT3) the RPD5 system includes functions like Pro-AM driver indication and Pitstop timer. A new record for SPAA05.com with Race Position Displays on 159 Endurance cars during the ADAC 24h of the Nurburgring in Germany, a special 18.8 display was manufactured for this event, top 30 qualifyers had green displays, all other cars had red displays. The SPAA05.com Race Position Displays showed a scrolling 100 number during the 2nd warmingup lap, this special feature was programmed in each car controller and was enabled bij X2 commands. The V8 Supercars series have selected the SPAA05.com Race Position Displays and will use an all new semi-transparent version of the LED displays mounted on the side windows of the Racecars during the October event at Bathurst. SPAA05 R&D is working closely together with the series to make the debut a success. The SPAA05 Race position Displays Indycar Mid-Ohio Debute was succesfull, All 25 cars had the all new 2 color LED panels installed. The Displays showed a very new feature, the Pit timer stopwatch, when a car stopped in Pit Road the Diplay changes in a green stopwatch showing the time the car stopped for fuel and new tires. After a succesfull test on Barber Motorsportpark USA, SPAA05.com has been awarded to provide the Race Position Display Sytem to the Indycar series. A brand new PLASMA type LED system of less than 3mm thickness has been developed to fit the Rollhoop cover. 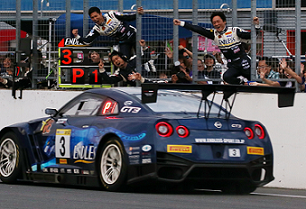 Dunlop 24hr at Silverstone race> from 24-26 April 2015. The LED displays will be on all cars and the teams can use the new Laptrigger.com software which gives them accurate laptimes, driver stints and Racecontrol messages and more. We are proud to announce that the SPAA05-RPD will be part of the new 32H Maxi Endurance race on Circuit the Algarve from 12-14 Dec. 2014. The Race Position Displays will be on all cars and the teams can use the new Laptrigger.com software which gives them accurate laptimes, driver stints and Racecontrol messages and more. Our Live Video Website will also show onboard footage. Our Race Position Display system has been used to enhance the viewer experience on the Hungaroring during the Hankook 12H of Hungary. Congrats to SPS Automotive Performance 1 for first place! In the 90th anniversary edition of the Total 24u of Spa Francorchamps, the SPAA05-RPD system will be used to enhance the viewer experience. The displays will be mounted on the cars from the GT4 and the BRCC race classes. Also for the 2014 race, SPAA05 has been invited to provide the Race Position Display system for use in the upcoming 24H endurance race of Zolder, Belgium. Additionally, SPAA05 will introduce a new scoreboard showing positions 1 through 10 on a 40 ft high display. After a succesful trial at the Dubai 24H race earlier this year, Creventic, the promotor of the 24H series, has decided to purchase the RPD for use in all their endurance races. Just a few days before 12H of Zandvoort, the new system was delivered. Next up is Barcelona (5-7th September), after which the RPD will be present at the Hungaroring in October. To emphasize the professional setup of the new European GT4 Series, their promotor has decided to use the SPAA05-RPD system in all race classes: GT4-Pro (BLUE), (GT4-Am (RED) and Ginetta (GREEN and ORANGE). For this season, the Supercar Challenge expands the use of Race Position Display, from the Super GT, GT and GTB classes, to the Supersports and Sports classes, now totalling more than 60 cars. After featuring at the Sebring 12H, the RPD will be used at the next race in the TUSC series at Long Beach, CA., 11-12 Apr. 2014. The SPAA05 RPD will feature in the upcoming Rolex 24 Daytona endurance race. The P and GTLM classes will use red LEDS, while the PC and GTD classes will use blue. The SPAA05 RPD has been succesfully used during the 2014 Dubai 24H endurance race on 53 cars in total. The A6 class had the color green, while the 997 class had red and SP2 and SP3 had blue and orange. Works with MyLaps and Mylaps X2, Tag Heuer, Timeservice, Alkamel and more.